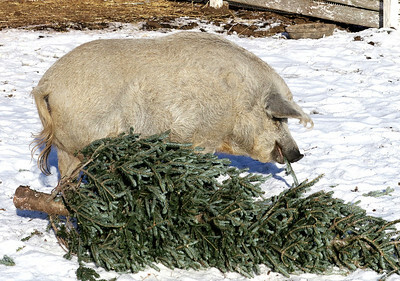 Candace H. Johnson - for Shaw Media Redman, a Hungarian Mangalitsa pig, eats a branch from a donated Fraser fir Christmas tree in the Farmyard at Lambs Farm in Libertyville on Saturday, Jan. 6, 2018. 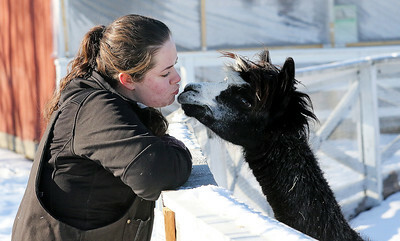 Candace H. Johnson - for Shaw Media Katie Donnellan, farmhand, gives a kiss to an alpaca named, Baby, in the Farmyard at Lambs Farm in Libertyville on Saturday, Jan. 6, 2018. 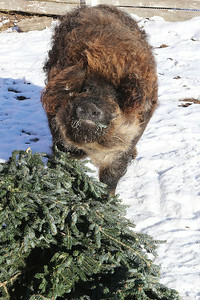 Candace H. Johnson - for Shaw Media Lula, a Hungarian Mangalitsa pig, eats a branch from a donated Fraser fir Christmas tree in the Farmyard at Lambs Farm in Libertyville on Saturday, Jan. 6, 2018. 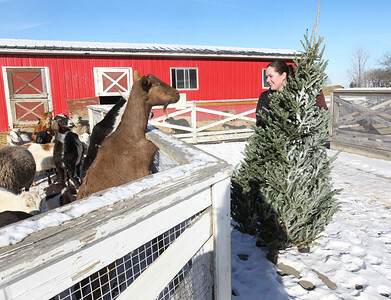 Candace H. Johnson - for Shaw Media Katie Donnellan, farmhand, and Jodi Miller, manager, work together to get a donated Fraser fir Christmas tree into the pen with goats and sheep for them to eat in the Farmyard at Lambs Farm in Libertyville on Saturday, Jan. 6, 2018. 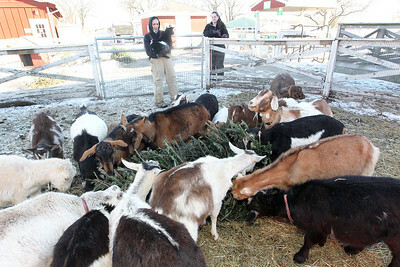 Candace H. Johnson - for Shaw Media Jodi Miller, manager, and Katie Donnellan, farmhand, watch the goats eat the needles and the bark off of a donated Fraser fir Christmas tree in the Farmyard at Lambs Farm in Libertyville on Saturday, Jan. 6, 2018. 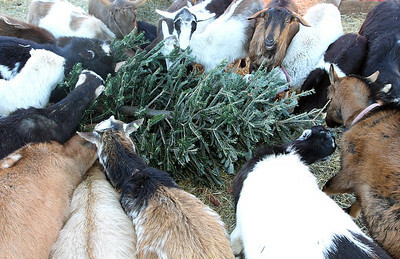 Candace H. Johnson - for Shaw Media Goats surround a donated Fraser fir Christmas tree as they eat the needles and bark in the Farmyard at Lambs Farm in Libertyville on Saturday, Jan. 6, 2018. 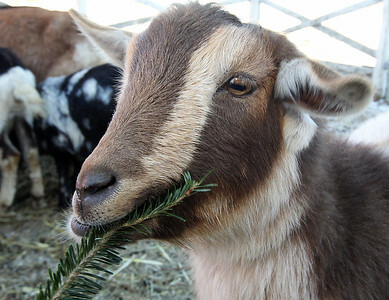 Candace H. Johnson - for Shaw Media A goat chews on the branch of a donated Fraser fir Christmas tree in the Farmyard at Lambs Farm in Libertyville on Saturday, Jan. 6, 2018. 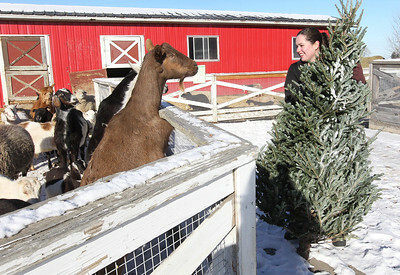 Candace H. Johnson - for Shaw Media Katie Donnellan, farmhand, walks past the goats with a donated Fraser fir Christmas tree to give to the pigs to eat in the Farmyard at Lambs Farm in Libertyville on Saturday, Jan. 6, 2018. 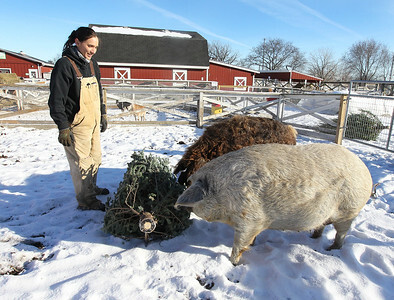 Candace H. Johnson - for Shaw Media Jodi Miller, manager, gives a donated Fraser fir Christmas tree to the Hungarian Mangalitsa pigs to eat and play with in the Farmyard at Lambs Farm in Libertyville on Saturday, Jan. 6, 2018. 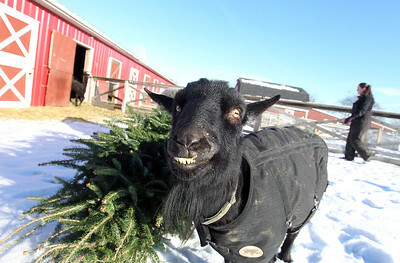 Candace H. Johnson - for Shaw Media A goat named, Bravo, is all smiles after finding a donated Fraser fir Christmas tree in his pen to chew on in the Farmyard at Lambs Farm in Libertyville on Saturday, Jan. 6, 2018. Jodi Miller, manager, and Katie Donnellan, farmhand, watch the goats eat the needles and the bark off of a donated Fraser fir Christmas tree in the Farmyard at Lambs Farm in Libertyville on Saturday, Jan. 6, 2018.